Another week resigned to the archives, the buzz term in the office appears to be stakeholder management at the moment! I have heard this a few times recently and today I had to provide a presentation about all the excitement. It was impressive and had Paul Daniels attended he would have liked it, not a lot but he would definitely have liked it! I decided that I would reward the achievement with a new haircut. Who doesn't want to look silky smooth, without referring to the Paul Mitchell handbook though I opted for Tony & Guy's!! Arrived full of anticipation and although there was a delay to the schedule, the silky smooth look was magnificent and thankfully I wasn't too late for the rendezvous. The dinner arrangement wasn't disrupted because it was organised for later in the evening. Made impressions at several bars around Hoxton and Shoreditch before arriving at Pizza East which I thoroughly recommend because the food and service were excellent! 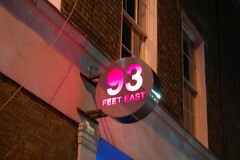 After cocktails at Beach Blanket Babylon Shoreditch we headed for 93 Feet East which always provides a great night of entertainment! Weren't disappointed either as we really enjoyed the music and the dance moves on display were exceptional although I felt that my 'crab' received the most acclaim! The evening ended by trying to make people yawn but this didn't work too well!! !